How accurate are your perceptions of others and their perceptions of you? Find out when you play the Veracity game. You are likely to discover things about yourself you never knew and perhaps even more enlightening is to learn what your family and friends have been thinking about you for all these years. Veracity is an energizing experience for couples who think they really know all about each other. It’s educational too. As well as discovering more about themselves and others, children have fun listening, reading, writing and increasing their vocabulary. What a great way to perk up that dinner party, family event or social gathering! The unique water resistant plastic case makes the game a perfect fit for your bookcase or your suitcase - no more broken boxes! Players take turns trying to match each others answers to a question like: What would I like to do if there were no consequences? If a player matches your answer, that player wins the card. If not, you win the card. 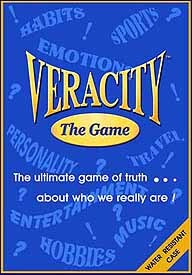 The first player to collect the cards that spell VERACITY is the winner. For those who like to test their luck, they can choose a TWIST card to see if they win, lose or trade a card. Veracity has an array of personal questions to ask you and all of the fun and laughter is based upon your answers. The questions may appear to be straightforward, but the candid answers could surprise you. Since there is more than one answer for every question, it’s a new game every time you play. No one is ever eliminated so everyone finishes at the same time. The RDG Team hasn't gotten around to writing a review for Veracity. YET. We're writing up new reviews all the time. (And adding new games to review!) And this one is on the To Do List. But we could really use your help! If you'd like to say a word or two about Veracity, click here and we'll put it online! We're looking for more reviews and strategies for this game. Submit yours here!